This year we must work together to open up Internet governance processes so that everyone can have their voices heard in the development of Internet policies. • The community must find a path for a successful IANA stewardship transition. • The mandate of the Internet Governance Forum (IGF) is up for renewal. 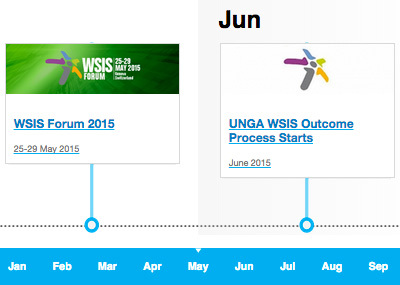 • The ten-year Review of the World Summit on the Information Society (WSIS+10) will be held in December. Most of these dialogues will impact the ten-year Review of the World Summit on the Information Society (WSIS). In June 2015, the United Nations will be launching a process leading to a "High Level Event" to review the implementation of the WSIS and to shape a vision for its future. The event will take place in December in New York. For the past 10 years, governments, the private sector, civil society, academia and the Internet technical community have worked together at the local and global levels to make the Internet a useful tool for economic and social development. All interested stakeholders are invited to endorse this letter! Please join with the current signatories in calling upon the UN to have an open and inclusive WSIS+10 preparatory process. As part of the WSIS Review, the extension of the mandate of the Internet Governance Forum (IGF) will also be negotiated. This is another good reason for including all stakeholders in the WSIS+10 negotiations! Historically, the IGF has been renewed by the UN General Assembly for 5-year mandates. The last IGF event of the current cycle is to be hosted by Brazil on 10-13 November in Joao Pessoa. After ten years of existence, the IGF has demonstrated the value of its multistakeholder model, but it is not resting on its laurels and seeks to improve continuously. The multiplication of IGF-type of initiatives in all regions is the sign of its vitality. It has learned to evolve, to meet new needs such as for best practices on cutting-edge issues like IXPs development or Spam mitigation. This year, the IGF is also launching a new and important exercise: developing "Policy menus for Connecting the Next Billion". In light of the upcoming launch of new U.N. Sustainable Development Goals (SDGs) to take over the Millennium Development Goals process, the latter seems extremely timely. Having been appointed Advisor to the Chair of the Internet Governance Forum ( IGF) in April, my goal has been to engage with all relevant stakeholders to work towards a successful IGF 2015, which is a key edition in light of the growing role of the Forum in the Internet governance ecosystem. The 2015 IGF program of work is ambitious, but I am confident that its key features — openness and inclusiveness — offer a solid framework leading to informed and consensus-based outcomes. This year again, one of the most successful outcomes of the WSIS should demonstrate the value of open frameworks for successful discussions. As the WSIS negotiations unfold, with their spin of dialogues and negotiations including on the renewal of the mandate of the IGF, we must continue to work to clear away complications and open doors for everyone to have their voices heard when it comes to how Internet policies are developed. It is healthy to have a discussion about what inclusive governance means for each of us, and from there build a collective post-2015 vision. Please join with us — and many other organizations — in calling upon the UN to open up the WSIS Review process to all stakeholders! Local Time: Friday, April 19, 2019 04:06 AM PDT – Page Load: 0.3050 Sec.